It was just before 4:30pm when Mrs Fuggles dropped Citra and Fuggles off in Far Cotton, just over the South Bridge in Northampton. A hasty trudge and a few minutes later we were in the Pomfret Arms, named after a French nobleman whose family cornered the potato chip market. Decent enough pub, flagstone floors with a central bar sporting 6 hand pumps although only 4 were in use. 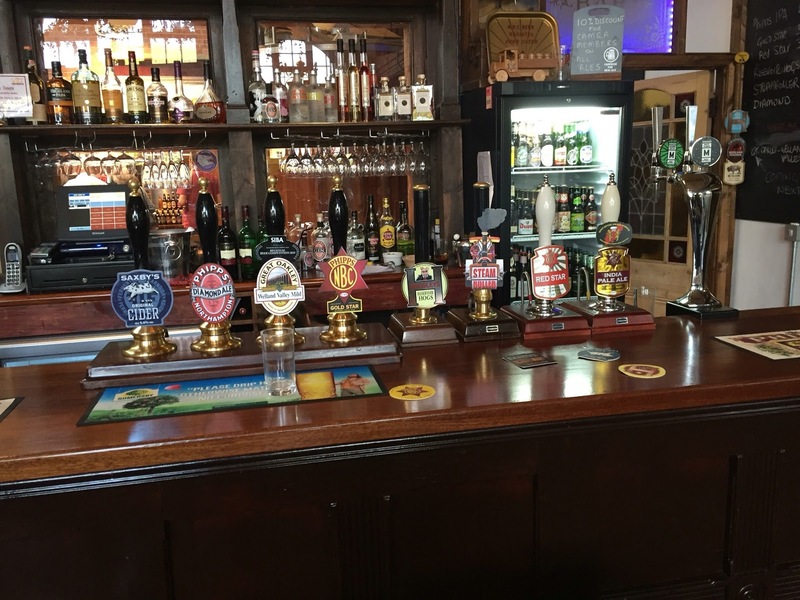 There is an enormous beer garden stretching back quite a away, this would be heaving in the summer months, especially at the end of May when they hold their own beer festival. 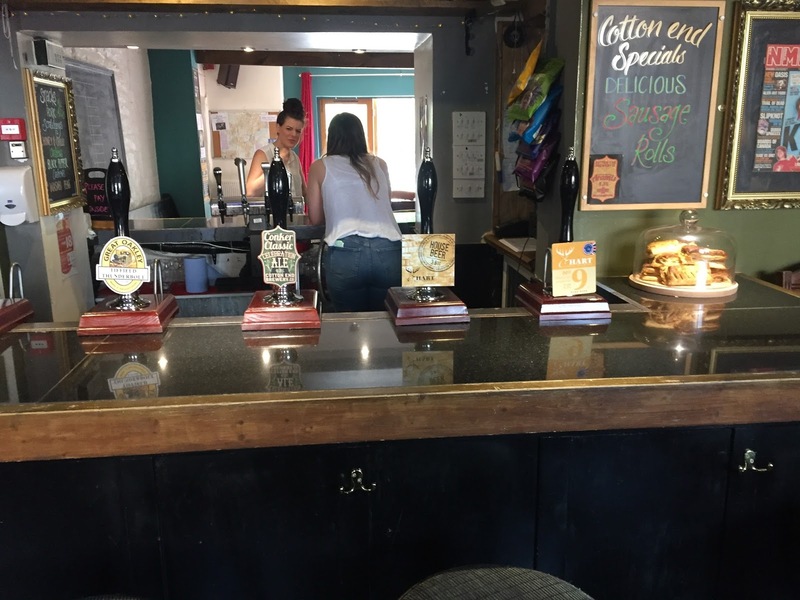 The ales available were 2 from Hart Family Brewers, No 9 and House Ale, Great Oakley Brewery’s Tiffield Thunderbolt and one of their own brewery Cotton End Conker Classis Celebration ale, we went for this. A delightful amber ale with bags of flavour, nice bitterness with a lingering toffee finish, 4.3% in very good condition with a tight head. We didn’t fancy any of the other ales available so we moved on to the Malt Shovel just a few hundred yards away. On route we needed to cross the busy road thus avoiding too much contamination from the Danish lager brewery, which now stands on the site of the former Phipps and NBC breweries. The Shovel is a nice pub with around 17 hand pumps although only serving 10 or so ales. The walls are adorned with inordinate amounts of breweriana, trays, from old defunct breweries, bottles galore and one pub sign that may be of interest to Kettering folk, The Stag and Pheasant, which is now the Shire Horse in Newland St, is mounted on one of the walls and it looks very nice indeed. 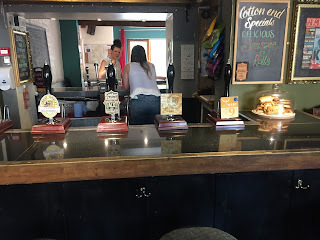 With so many ales it’s difficult to know where to start, staring right at us was 3 Oakham Ales, and Citra was salivating and eventually succumbed going for his namesake. A typical Oakham beer, pale and citrusy 4.2% and in good condition. Although it should be noted that Citra is on the verge of panic, there is a worldwide shortage of the hops that give ales this very citrusy zesty flavour. This style of ale could be under threat as some hop varieties are being priced very highly and outside the budget of some of the breweries. Fuggles went for Nobby’s Mavis Enderby, 3.8% golden blonde ale, quite a good tasting ale, very refreshing indeed and a pleasant surprise. Next up we both went for Northampton brewery Frog Island’s Natterjack Toad, oh dear, it was flat with a hint of vinegar. Fuggles had been extolling the delights of this ale what a let-down, we had to take it back. So surprise surprise we went for Oakham’s Bishops Farewell, Fuggles favourite ale, named after Bishop Bill Westwood of Peterborough who retired in 1995. 4.6% of golden citrus flavours, marvellous. As you would expect with Oakham Ales they are always very clear. Fuggles had another one whilst Citra went for the full set and had JHB, yet another blonde citrusy ale coming in at 3.9%. always a favourite ale this one, very refreshing and easy drinking for a good long session any time of the year but especially good in the warm summer months. That was it for the Shovel, time to pop just up the road to the Albion Brewery Bar home of the Phipps NBC brewery. The bar opened in July 2015, the Brewhouse can be seen through the glass panels, this evening there appeared to be a brewery tour in the early stages with quite a few chaps downing the first of the night. Citra and Fuggles went for, wait for it, DIAMOND ALE, we had this in the vague notion that by drinking it we were consuming them, unfortunately Fuggles dropped his Poppies tie on the floor at the very same moment he went to pick up his pint, NOOOOO, the omens are against us. Still it was a decent pint with just a very slight haziness, 3.7% hoppy and quite refreshing. Pharp arrived, blown in on the wind, closely followed by a gasping Petit Chemise, he should have known better. Pharp went for Red Star, 3.8% reddish colour, a typical English pint, slightly nutty flavour, the sort of ale people would drink 50 years ago. Petit settled for the Phipp’s IPA, their flagship ale. This is a delightfully refreshing ale, easy drinking, in fact too easy coming in at 4.3% this could creep up on you over a decent session. As the name might suggest a pale ale, bags of flavour and always a favourite historical ale throughout Northamptonshire. That was it, time for the footy; we must now make our way to Northampton Town’s Sixfields Stadium. Sixfields is a very nice council built stadium, with a few mods going on. The Poppies were housed in the West main stand whilst the Diamonds fans were in the ‘Home end’. The game, well ignore the statistics; they say possession is nine tenths of the law, not in football it’s not. If this game was a boxing match the Poppies were heading for a unanimous points victory, that was until 2 minutes and 40 seconds into the fifteen round, a haymaker came in from the left and hit straight onto the forehead, a knock-out blow to say the least. 95% possession counts for nothing, when you only score 33% of the goals. The Poppies won the attendance stakes with just under 700 making the trip, The Diamonds had just shy of 500; although they do protest they had many more there. The PRATS can confirm that we carried out a head count and concur with them; they had at least twice that number. The Poppies choral society was in good voice, one particular tune was all about a former Poppies winger’s headgear which coincidently corresponded with his trade as a city banker. We watched the presentations, applauded gracefully, smiled and shook hands with several of the Diamond’s players, we said “well done” though gritted teeth and then went back to the Albion Brewery bar. Citra and Fuggles went for the Phipp’s IPA whist Pharp once again sampled the Red Star; Fuggles followed this up with the stronger Golden Star, the others stayed with what they already had. Golden Star is a powerful 5% strong ale, quite sweet, with a hint of barley sugar but pleasant enough, not an ale you could drink all night, it was in good nick. We chatted for about an hour trying to understand how you can lose a game you’ve dominated, but that’s football; the season is over bar the shouting. We do have a beer festival next weekend which includes the Fans Match then the presentation evening the weekend after. Oh dear, Mrs Fuggles has already got the summer jobs lined up, I suspect the old sciatica is due to make its annual appearance.